“What a nabe!” indeed. Hideki Watanabe, a dentist from the city of Iyo in southwestern Japan, has created a new type of cooking pot that not only stirs itself, but also saves energy by reducing the time it takes a pot of water to boil. 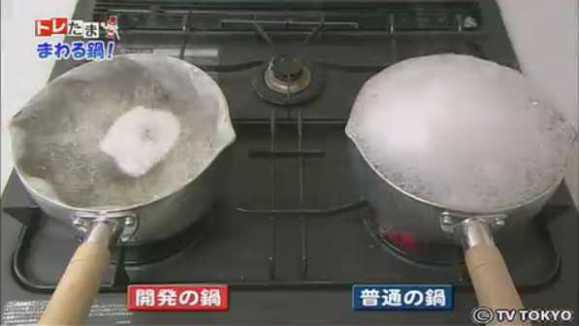 The so-called Kuru-Kuru Nabe, or “Round and Round Pot”, puts basic thermodynamics to work so you don't have to. The secret is the sculpted sides of the pot, something Watanabe came up with while experimenting with dental plaster at his office. 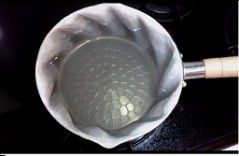 As water in the pot begins to warm up, it rises, but the spirally angled sides of the pot direct the flow into a circular direction. Check out this video to see the Kuru-Kuru Nabe in action... wow, those beads look tasty! As you can see, the inertia of the moving water results in more efficient heating of the pot's contents so the water's boiling point is reached in a shorter time, thus saving energy. As well, the spinning water tends to rise higher along the sides of the pot, channeling pasta or other foods into the center of the pot and making it much easier to skim foam off the surface. Speaking of which, the convective flow tends to compact and concentrate any foam thus reducing the chance your pot will boil over. Most importantly for kitchen klutzes who are more likely to burn water than boil it, the self-stirring pot keeps macaroni and other types of pasta shells from resting against the hot bottom of the pot... and sticking there. Chef Ramsey might not be impressed but your dining guests sure will be! In the U.S., the self-stirring pot is not yet available. We'll just have to settle for an automatic stirrer. UPDATE: The self-stirring pot is now available for purchase in the United States. You can buy the Kurukurunabe Self-stirring Pot here. Originally published May 2012 and updated December 2015. Archaic Lingerie: Armored Underwear, Scary or Scandalous? Where can I get ten?